Seawater is a complex solution containing a wide variety of organic and inorganic chemicals. 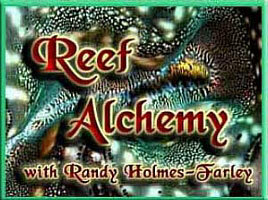 While some of these are frequently discussed by reef aquarists, others are rarely mentioned. Without a working knowledge of what is present in natural seawater, it is often difficult to assess aquarium problems, as well as the claims of manufacturers and other aquarists about what additives and methodologies are desirable in maintaining reef aquaria. This article is intended to help aquarists better understand the water in their aquaria. It strives to give a better understanding of what happens in seawater than does a simple table of elemental concentrations, although such tables are also provided. How do Ions Behave in Seawater? 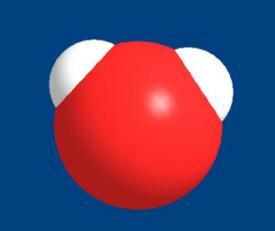 A water molecule is composed of two hydrogen atoms bonded to a single oxygen atom (H2O; Figure 1). Water comprises about 96.5% of the mass of natural seawater. A 100 gallon aquarium contains approximately 12,500,000,000,000,000,000,000,000,000 water molecules. One of water's most important properties is that it is primarily a liquid, rather than a gas, at room temperature. Most other molecules of similar size and weight (e.g., oxygen, O2; nitrogen, N2; ammonia, NH3) are gases at room temperature. The reason that water is a liquid is that it forms strong intermolecular hydrogen bonds in which the hydrogen atom from one water molecule forms a transient chemical bond, called a hydrogen bond, to the oxygen atom in a nearby water molecule. While each of these bonds lasts only a fraction of a second, it rapidly and repeatedly reforms after being broken. This network of hydrogen bonds (Figure 2) holds the water together as a liquid rather than letting it fly apart as a gas. Water forms hydrogen bonds because the electrons in water molecules are not evenly distributed. Oxygen is more electronegative than hydrogen, so the central oxygen atom draws electrons from the hydrogen atoms toward itself. This movement of electrons leaves the oxygen atom with a partially negative charge and the hydrogen atoms with a partially positive charge; this redistribution of electrons is called a dipole. When one water molecule interacts with another, there can be an interaction between a partially positively charged hydrogen atom and a partially negatively charged oxygen atom, creating a "hydrogen bond." Figure 1. A space-filling model of a water molecule. The central oxygen atom is shown in red, and the two hydrogen atoms are shown in white. Additionally, water's dipolar nature allows it to interact strongly with charged ions in solution. Several water molecules, for example, cluster around each ion, and orient themselves to take advantage of these ion and partial ion interactions. For example, water orients with its oxygen atoms pointed toward the positively charged calcium ion (Ca++) in solution. This effect is very important for many properties, from solubility to osmotic pressure. by hydrogen bonds (shown in red). Seawater tends to have a higher density than does freshwater, due to seawater's higher density of dissolved salts. Seawater with a salinity of 35 ppt is about 1.0264 times as dense as freshwater at the same temperature, and so is said to have a specific gravity of 1.0264. This property is the reason that hydrometers are a suitable way to measure salinity. Seawater also refracts light (bends light passing through it) more than freshwater does. This effect is due to the more refractive nature of the ions in solution compared to freshwater. The refractive index of freshwater is about 1.33300 while that of seawater with a salinity of 35 ppt is about 1.33940. Refractometers take advantage of this property and allow aquarists to measure salinity by refractive index. The charged ions in seawater can conduct electricity. Not only does this attribute make seawater aquaria dangerous from an electrical safety perspective, it also allows aquarists to measure salinity via conductivity. The more charged ions present, the higher the conductivity, and a device that can appropriately measure conductivity can lead to useful determinations of the salinity. The conductivity of seawater with a salinity of 35 ppt is 53 mS/cm, while for purified freshwater, it is below 0.001 mS/cm. When seawater evaporates, water enters the atmosphere, but salts generally remain behind. These salts can then become more and more concentrated if the evaporated water is not replaced, or if it is replaced with seawater containing additional salts. When this happens in a salt collection pond, it may be desirable, but if it happens in a closed lagoon or a marine aquarium, the salinity may rise to the point at which marine organisms are stressed or killed. Seawater, with its many charged ions, has a higher osmotic pressure than does freshwater. In short, water "prefers" to be mixed with the charged ions. That is, it is in a lower energy state when it contains charged ions for the reasons described in the previous section. Consequently, if freshwater and salt water are separated by a membrane that only water can pass through, water will stream from the freshwater into the salt water. If that process is allowed to equilibrate, water will flow until the salt concentrations on each side are the same or, if pressure is allowed to build, it will continue until higher water pressure on the seawater side pushes back against the incoming water to stop it. That pressure is called osmotic pressure. The osmotic pressure between 35 ppt seawater and freshwater is 25.9 bar (25.5 atmospheres) at 25°C. Because water is attracted to salts in seawater, water vapor's pressure over seawater is lower than over freshwater at the same temperature. It is about 2% lower over seawater, which at 25°C is 23.323 mm Hg, while freshwater has a vapor pressure of 23.756 mm Hg at the same temperature. Ions and other dissolved chemicals are usually quick to diffuse and otherwise mix through a few feet of water. An aquarium with typical circulation will show no significant differences in chemical properties as a function of depth or across the aquarium, except in the case of things being continually added (such as dripping limewater) that may take time to be fully mixed in. The ocean, where distances are much greater compared to the movement of currents and diffusion in a few days time frame, can show significant variations in chemical composition as a function of depth and location. Seawater with a salinity of 35 ppt has a freezing point that is 1.9°C (3.4°F) lower than freshwater. This freezing point depression comes about because the ions in the water tend to make the water more stable in its liquid form than as a solid. When seawater freezes, most ions are excluded from the ice, although some, such as sulfate, can be incorporated to some extent. Consequently, the salts in sea ice do not match the seawater's composition. The pH of seawater is typically stated to be 8.2 ± 0.1, but it can vary as photosynthesis consumes carbon dioxide locally and as respiration produces it. It also varies by latitude and is often lower where there is upwelling. It is also a function of depth for a variety of reasons, including photosynthesis near the surface, decomposition of organics in the mid-depths (dropping pH to as low as 7.5 by 1000 meters), and dissolution of calcium carbonate in very deep water (raising the pH back up to around 8). In closed lagoons, the pH can cycle from day to night just as in a reef aquarium, rising several tenths of a pH unit during the day. In special circumstances, seawater can be much lower in pH. Seawater in mangroves where highly reducing sediments are present can reduce the pH to below 7.0. In the open ocean, where there is a much larger volume of water containing buffers, the pH fluctuates little. As humans have added carbon dioxide to the atmosphere, more carbon dioxide has also been added to the oceans, with a consequent drop in pH. This is one of the impacts humans have had on the oceans that concerns ecologists in terms of its impact on calcifying organisms, especially on coral reefs but also on other systems involving such organisms as foraminiferans, which have calcareous skeletons and which are important links in many marine food webs. The alkalinity of natural seawater is primarily a measure of bicarbonate plus two times the carbonate concentration. In the ocean, it varies by location and depth. In surface waters, it usually varies between about 2.25 and 2.45 meq/L (6.3 to 6.9 dKH), and often varies with changes in salinity. In deep water and upwelling water, it may be higher due to dissolution of calcium carbonate that is driven by pressure. Nearly every element known to man has been found in seawater (Table 1). Some are present at very high concentrations, and some are vanishingly rare. This linked website shows a periodic table of elements that can be pointed at with the cursor to see the concentration of each in seawater, as well as a host of other properties of the element. The sections that follow in this article detail the concentrations and other interesting aspects of many of the elements of most interest to reef aquarists. Table 1. Concentrations of many elements in natural seawater. 1 µg/L » 1 ppb; 1 ng/L » 1 ppt (part per trillion); 1 pg/L » 1 ppq (part per quadrillion); see this linked article on unit definitions for more information on the relationships between these units. Most of seawater's constituents are inorganic ions. Figures 3 and 4 (below) show the primary ions present by weight and number. Sodium and chloride (the two ions in table salt) are the two primary ions in seawater. At 19,000 ppm for chloride and 10,500 ppm for sodium, they comprise 54% and 30% of the total weight of ions in seawater, respectively. The next two most common ions, magnesium (at 1280 ppm) and sulfate (at 2700 ppm) comprise 3.7% and 7.7% of the weight of seawater ions, respectively. Together, these four ions comprise almost 96% of the weight of ions present. Figure 3. Relative concentration of ions in seawater by weight. While these facts may seem unimportant to aquarists, they have significant implications. For example, the salinity of seawater, whether measured with a hydrometer, a refractometer or a conductivity meter, is dominated by these four ions. Deviations in the concentration of any other ion, even if significant for other reasons, will not significantly alter such measurements. For example, whether the calcium is 300 ppm or 500 ppm will not be noticeable in a typical salinity determination. That difference represents only a 0.6% change in the total weight of salts present, changing the salinity from 35 ppt to 34.8 ppt. Likewise, whether the alkalinity is 5 meq/L (14 dKH) or 2 meq/L (5.6 dKH), the change in salinity is only about 0.5%. Another important implication of the high concentration of these other ions is that they move around only very slowly when perturbed by additives and foods. For example, adding calcium chloride boosts chloride more than it does calcium, but since there is already a background of 19,000 ppm of chloride, such additions do not rapidly disturb the relative ratios of the various ions in seawater. Figure 4. Relative concentration of ions in seawater by number. Interesting (well, at least to chemists) is the fact that since a sulfate ion (SO4--) weighs four times as much as a magnesium ion (Mg++), it is actually present in smaller numbers than magnesium ions (Figure 4) even though it is present at a higher weight-based concentration (Figure 3).One other comment on magnesium concentrations in seawater - - seawater's magnesium content, along with that of other ions, has not been constant since the oceans formed. Specifically, it has often been lower, as in the late Cretaceous period. The amount of magnesium incorporated into the calcium carbonate skeletons of organisms such as corals is a function of how much magnesium is in the water. Consequently, the magnesium content of ancient sediments can be significantly lower than more modern ones from similar organisms. In addition to being an interesting fact, this result may also play a role in the suitability of certain limestone deposits in maintaining magnesium in aquaria. For example, such limestone is sometimes used in CaCO3/CO2 reactors or as the raw material for making calcium hydroxide (lime). If it is low in magnesium, additional supplements may be necessary to maintain modern seawater magnesium concentrations. The seawater's major components are usually defined as those ions present at greater than 1 part per million (ppm) or 1 milligram per liter (mg/L) (Table 2). A different definition of major ions based on the numbers of ions present, rather than the weight of those ions, has a slightly different list, with lithium (0.17 ppm) being added. Together, these ions account for 99.9% of seawater's solutes. Table 2. Major ions in seawater. One important point about these concentrations: they are correct for only typical seawater, which contains about 35 parts of salt by weight per thousand parts of seawater (35 ppt). This seawater has a specific gravity of around 1.0264 which may be higher than is maintained in many marine aquaria. As the salinity of seawater varies, these concentrations typically move up and down together. Consequently, if an aquarium contains water with a specific gravity of 1.023, the salinity is about 30.5 ppt and all of the concentrations in Table 1 are reduced by about 13 percent. All of these major ions are essentially unchanged in concentration at different locations in the ocean, except as salinity changes move them all up or down together. Ions that do not change concentration from place to place are referred to as "conservative type" ions, a description that also applies to some of the minor and trace elements that are discussed below. The major ions include many that are critical to aquarists, such as calcium and bicarbonate, and others that are rarely considered, such as potassium and fluoride. Many of these have been discussed in previous articles that are linked in the references section at the end of the article. Organic molecules may also meet the definition of being a major component of seawater (Table 2), but they are traditionally not considered a major specie in seawater. The nature of these organic compounds is discussed later in the article. There are various definitions of which ions in seawater constitute the "minor ions." By some definitions, the list of constituents is rather long. Table 3 shows just a few of the constituents of seawater that are often labeled as minor ions. The more abundant of these are sometimes lumped with the major ions (such as lithium), while the least abundant (such as iron) are often lumped in with trace elements. Ions in this category often vary significantly with location in the ocean. That is primarily because many of them are tightly linked to biological activity. These ions can be locally depleted if biological activity is high enough. Ions that vary in this fashion are referred to as "nutrient type" ions, because they are consumed by one or more types of organism. Table 3. Some typical minor and trace ions in seawater. Table 4. Atmospheric gases in seawater at 25°C when in equilibrium with air. Any gas present in the atmosphere will be present in seawater. Many of these are unimportant to reef aquarists, but two are of critical importance: oxygen and carbon dioxide. Aside from carbon dioxide, all of the gases have lower solubility in seawater as the temperature and salinity are raised. Table 4 shows the concentration of the most common gases in seawater at 25°C. Carbon dioxide is a special case. It hydrates on contact with water to form carbonic acid, which can then ionize (break apart) to from hydrogen ions, bicarbonate and carbonate, as shown below. Table 5. Fate of carbon dioxide in the ocean after 1000 years. For this reason, carbon dioxide is much more soluble in seawater than is any other atmospheric gas. It is more soluble than all the other gases combined, in fact, with a total solubility of about 100 ppm of carbon dioxide. An interesting question to ask is, "What happens to carbon dioxide that is mixed into the ocean?" After 1000 years, it is thought that it ends up in the forms shown in Table 5. Additional discussion of carbonate and bicarbonate in seawater is provided in subsequent sections of this article. Many other gases are dissolved in seawater, but it is beyond the scope of this article to describe all of them. Many have biological significance, including hydrogen sulfide (H2S), methane (CH4) and other organic gases, carbon monoxide (CO), hydrogen (H2) and nitrous oxide (N2O). There is much discussion about trace elements in marine aquaria, and for good reason. Most chemicals dissolved in seawater are classified as trace elements simply because so many ions and molecules are present at very low concentrations (Table 1). In many cases, these ions are quite variable in concentration from place to place and also as a function of depth. Anyone wishing to view extensive lists of these ions is advised to check the appropriate references given at the end of this article. Many trace elements are metals. While people typically view dissolved heavy metals as toxic, several of them are essential for organisms. Their toxicity is primarily related to their concentration: a happy medium is essential, where enough of each of these metals is present for life to exist, but not so much is present as to be toxic. A good example is copper. It is present in natural seawater at about 0.25 parts per billion (ppb), which is about a thousand times less than the toxic levels often used to kill microorganisms in the treatment of sick marine fish. Copper is, however, necessary for many animals to survive. Unlike most of the major ions, many of the minor and trace elements take many different forms in seawater. Consequently, a single measure of the amount of a particular atom (e.g., copper, iodine or iron) says little about its different forms, its bioavailability to organisms or its toxicity. Iodine in seawater, for example, takes the forms of iodide (I-), iodate (IO3-) and organoiodine compounds, of which there are many, including methyliodide (CH3I). In some cases, these differences are well-established for natural seawater, and in other cases, such as metals bound to organics, they continue to be poorly understood. It is safe to say, however, that far less is known about such issues in reef aquaria, where unnatural materials are often added (e.g., chelated metals, iodine as I2, etc.) and concentrations of certain species may be far higher (or possibly lower) than in natural seawater (metals, organics, phosphate, nitrate, etc.). Organic compounds are defined by chemists as those that contain carbon and hydrogen atoms. They can contain other atoms as well, and often contain both nitrogen and phosphorus. Organic materials have many important properties in seawater, including being food, toxins and metal binding agents. They also cause most odors, can inhibit the abiotic precipitation of calcium carbonate and can reduce light's penetration through the water. Oceanographers often classify organic materials as being either dissolved organic matter (DOM) or particulate organic matter (POM). The definition is operational, with DOM being defined as all organic materials that can pass through 0.2 - 1.0 mm filters, and POM being all materials that are retained by such filters. While this definition is useful and easy to interpret, it can be somewhat misleading. A chemist, when asked about a 0.2 mm droplet of oil in water, would not claim that it was "dissolved" in the water, yet it would fall into the definition of DOM. In a reef aquarium and in nature, things described as POM would include living organisms, such as some bacteria and phytoplankton (and all of the "dissolved" organic materials inside their bodies). It would also include what aquarists frequently refer to as detritus: the accumulated particulate organic material that arises from parts of dead organisms and the clumping of dissolved organic materials. The chemical nature of the organic matter in the ocean is poorly understood. Part of the reason for this lack of understanding stems from the tremendous variety of organic materials that exist in the oceans. There is essentially no limit to the number of different organic compounds that are theoretically possible, and the fact is that many millions of organic compounds have been synthesized or identified. Identifying and quantifying every possible organic material in seawater is just not possible, at least with present day technology. Consequently, identifying the form organic materials take in the ocean most often involves grouping them into classes by a functional test, such as whether they can be extracted from the water with a hydrophobic solvent, whether they contain nitrogen or phosphorus, etc. Only a small number of organic compounds have been individually identified and quantified in seawater, comprising 4-11% of the total organic carbon. Dissolved organic material in the oceans is often measured in terms of its carbon content, and is referred to as dissolved organic carbon (DOC) and particulate organic carbon (POC). Surface ocean water typically has about 0.7-1.1 ppm DOC. Particulate organic material (POM) is more complicated to quantify than DOM, because by definition POM includes all organic materials larger than 1 mm (micron). That definition includes everything from bacteria to whales. Identifying it as discrete chemicals is also a fruitless exercise. Nevertheless, suspended POC is frequently less plentiful than DOC, often by an order of magnitude. In the previous sections I have described what ions are present in seawater, but not how they interact with each other. To a first approximation, the major and minor inorganic ions in seawater move around independently of each other, forming a continuous haze of charged ions moving through the water. Many of the ions are, however, partially and temporarily attached to each other in solution and do not act as completely individual species. The tendency to form ion pairs in solution is much more prevalent for some ions (e.g., calcium, Ca2+; magnesium, Mg2+; carbonate, CO3--; fluoride, F-; hydroxide, OH-) than it is for some others (e.g., sodium, Na+; potassium, K+; chloride, Cl-; bromide, Br-). In general, the tendency to form ion pairs is higher for ions with a higher net charge. Such ion pairs have a significant impact on various properties of seawater that have great importance to aquarists, such as the solubility of calcium carbonate. The simplest positively charged ions in solution are sodium (Na+) and potassium (K+). They are primarily free ions, with a shell of three or four tightly bound water molecules attached to them. This is known as the "primary hydration sphere." These water molecules are fairly tightly bound, but are rapidly exchanged with other water molecules from the bulk solution (at a rate of about a billion exchanges per second for each ion!). Beyond this first shell are another 10 to 20 water molecules that are less tightly bound, but that are still strongly influenced by the metal ion. These types of hydrating water molecules are present for all ions in solution and won't be mentioned further for each ion in turn. A small portion of both sodium and potassium (about 5%) exists as ion pairs with sulfate, forming NaSO4- and KSO4-. This type of ion pair is best viewed as a temporary association between the two ions and may last for only a very small fraction of a second before the ions move apart. Nevertheless, this type of association can have important implications for the behavior of these ions. Ions forming such pairs actually "touch" each other. That is, most or all of the hydrating water molecules that are in between them have been temporarily removed. This removal of the intervening water molecules is the primary distinction between ion pairs and ions that are simply near each other. The simplest negatively charged ions, chloride (Cl-) and bromide (Br-), form few ion pairs in solution. They are present primarily in the form of hydrated free ions, with two and one tightly bound water molecules, respectively. One of the more complex interactions, and one that is very important for reef aquarists, involves carbonate (CO32-). 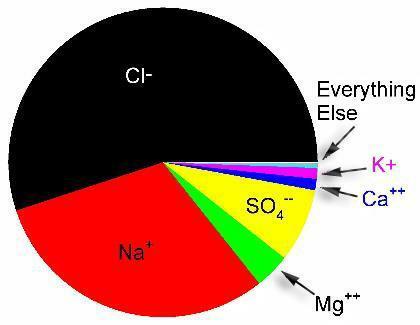 Carbonate is primarily ion paired in solution, with only about 15% actually present as free CO32- at any given point in time. This fact is important to the maintenance of calcium and alkalinity levels in aquaria, because it is the free carbonate concentration that can precipitate with calcium as calcium carbonate (CaCO3). If the free carbonate levels rise too much, the calcium levels will drop due to CaCO3 precipitation. Carbonate forms ion pairs primarily with magnesium, forming soluble MgCO3. This effect is one reason that magnesium levels are so important in marine aquaria for maintenance of simultaneously high levels of alkalinity and calcium. If magnesium is too low, more carbonate will be in the free form, and it will be more prone to precipitate as calcium carbonate. Carbonate is also ion paired to sodium and calcium, forming soluble NaCO3- and CaCO3, respectively. The soluble calcium carbonate ion pair sounds odd, but it is essentially one individual molecule of CaCO3 that is soluble in water; it is not precipitated out of the solution. 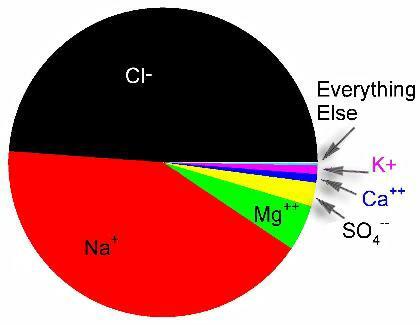 The fact that carbonate is also ion paired by sodium is one of the reasons that salinity has an impact on the amount of calcium and alkalinity that can be maintained in solution: lower salinity means less sodium, which means more free carbonate and a greater likelihood of CaCO3 precipitation. When CO2 is added to water, the system will come to equilibrium with specific concentrations of each of the species shown above. By LeChatelier's principle, if something is removed from one side of the equilibrium, the equilibrium will shift in that direction. For example, if carbonate is removed from the system, then each of the reactions shown will proceed to the right, effectively replacing some of the carbonate that was removed. Importantly, that is exactly the effect that takes place in seawater when carbonate is "removed" by forming ion pairs. It is only the "free" concentration of these species that determines the position of the chemical equilibrium, so carbonate in the form of an ion pair does not "count," and the equilibrium shifts strongly to the right. If we count carbonate in all forms (free and ion paired) it is found to be far higher in seawater than in freshwater at the same pH, and ion pairing is the primary reason. In this case, if CaCO3 is added to water, it breaks apart into Ca2+ and CO3--. Eventually, an equilibrium is reached where no more CaCO3 will dissolve. However, if some of the carbonate is removed by ion pairing (and some of the Ca2+ as well), then additional CaCO3 can dissolve to replace that which was "lost." This is the primary reason that CaCO3 is approximately 15 times more soluble in seawater than in freshwater. Bicarbonate (HCO3-) is present in seawater at a significantly higher concentration than carbonate, although the exact ratio depends on pH (a lot), temperature (a little) and salinity (a little). At pH 8.0, there is about seven times as much bicarbonate as carbonate. The percentage of carbonate rises as the pH rises until at pH 8.9 (at 25°C), there are equal concentrations of carbonate and bicarbonate. Unlike carbonate, bicarbonate is not extensively ion paired, with only about 25% of it paired to sodium, magnesium and calcium. Both carbonate and bicarbonate have critical importance to reef aquarists, with bicarbonate being important as the source of skeletal building materials, and carbonate controlling the precipitation of calcium carbonate on heaters and pumps. Calcium, magnesium and strontium are present primarily in the free form, hydrated by six to eight tightly bound water molecules. A small amount of each (about 10-15%) is present as ion pairs with sulfate ions. Much smaller percentages are present as ion pairs with carbonate and bicarbonate. Importantly, while these complexes involve only a small percentage of the total calcium and magnesium, they involve a large portion of the total carbonate (which is possible because there is so much calcium and magnesium compared to carbonate). The average residence time (that is, how long, on average, an ion stays in the ocean before being deposited into sediments) for magnesium in seawater is on the order of 45 million years. That time is substantially longer than that of calcium (a few million years) but less than sodium (about 250 million years). In a sense, this result stems from its high concentration and from how readily it is deposited in various minerals. Calcium is taken out more rapidly as it is deposited into calcium carbonate skeletons. Strontium falls between calcium and magnesium in terms of residence time, reflecting its fairly slow uptake but also its fairly low concentration. Magnesium is especially important for its role of preventing the abiotic precipitation of calcium carbonate from seawater. Seawater is supersaturated with respect to calcium carbonate, but any time that it begins to precipitate, magnesium attaches to the growing crystal's surface and inhibits further precipitation. Consequently, the ocean can stay supersaturated for long periods of time. Phosphate in the ocean and in marine aquaria is of tremendous importance because it is often a limiting nutrient for algae growth. In seawater, the amount of phosphate present is typically quite low (usually less than 0.05 ppm) and often varies significantly by location and depth. Much of the phosphate present in seawater is rapidly cycled through living organisms. In many marine aquaria, though, the phosphate concentration can be significantly higher (up to several ppm). The ability to export phosphate from marine aquaria has been the topic of lengthy discussion and is the object of numerous commercial products. The nature of the inorganic phosphate present in seawater and in marine aquaria, however, is certainly more complicated than traditionally credited. Ignoring ion pairing and complex formation for the moment, phosphate is primarily found in the HPO42- and PO43- forms in seawater. This is quite different from the forms found in freshwater at the same pH, where the H2PO4- and HPO42- forms predominate. Table 6 shows the forms of phosphate present in seawater at a pH of 8.0. To a large extent, the high proportion of phosphate present in the PO43- form in seawater is due to ion pairing, just as in the case of carbonate. The various phosphate species pair extensively with magnesium and calcium in seawater. PO43- is nearly completely (96%) ion paired, while only 44% of HPO42- is paired. This is what causes the shift in the equilibrium to more of the PO43- form in seawater compared to freshwater (just as it does for carbonate). Additionally, phosphate interacts with certain ions in a manner that is stronger than simple ion pairing. Phosphate can, for example, complex with a number of positively charged species, including both metals (e.g., iron) and organics. These interactions further serve to reduce the concentration of free phosphate and are the basis of many of the various phosphate-binding media sold to aquarists. Phosphorus is also contained in dissolved organic compounds. While natural seawater has more inorganic phosphate than organic forms, this may not be true in aquaria where much higher organic levels may prevail. Table 7. 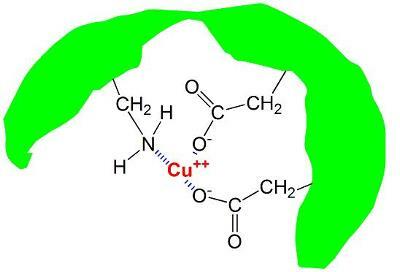 Copper species found in organic-free seawater. Many metals in seawater are even more complicated than the ions described above. Not only are many of them ion-paired, but many are also bound to organics. They are also often present at very low concentrations, and can be, in some cases, limiting to the growth of phytoplankton in the ocean (iron, for example). The individual trace metals are too extensive to detail in this article, and copper will be used as a surrogate to discuss the properties of many metals, although their individual properties vary substantially. Copper in organic-free seawater is strongly ion paired. In such a solution it would form a number of different species as shown in Table 7. Additionally, it has recently been established that copper is almost completely bound by organic materials in natural seawater. The cycling of bioactive metals therefore is intrinsic to the behavior of this subset of organic constituents." chelated by a naturally occurring humic acid (shown in green). In one recent study of copper in natural seawater, more than 99.97% was bound to organic materials.3,4 Other metals, such as zinc, may not be as extensively chelated. In reef aquarium water, where the level of both metals and organics can be higher than in seawater, the percentage bound to organics may be even greater. Nevertheless, unchelated metals are also very important. In the case of copper, for example, the unchelated copper ions may represent that portion of the total copper that is toxic to many organisms.3,4 These inorganic forms of copper and other metals are also expected to predominate in freshly mixed artificial saltwater that has not been exposed to sources of organic materials. What implications does the formation of organic/metal complexes have to aquarists? Since metals take many different forms in aquaria, the nature of these different forms must be considered to develop methods for exporting them from aquaria. For example, metal ions such as Cu++ or Ni++ will never absorb at the air/water interface to permit selective removal by skimming. However, if the same metals were bound to an organic material that itself adsorbed to the air/water interface, the metals might well be exported by skimming. Similar concerns relate to claims about metal removal using activated carbon, polymeric ion exchange and complexation resins, and binding to inorganic materials such as iron oxides and calcium carbonate. In fact, any proposed method of metal removal will be significantly impacted by the nature of the metal speciation. Depending on what is added to any particular aquarium, the speciation may actually vary from aquarium to aquarium, potentially making generalizations about them less useful. Many organic and inorganic forms of nitrogen are present in seawater at concentrations lower than nitrogen gas (discussed in a previous section). The organic forms are poorly defined, but include such molecules as amino acids and proteins. The inorganic forms are much more familiar to aquarists as components of the nitrogen cycle. The concentrations of these components in seawater are highly variable. In natural seawater, ammonia (NH3) ranges in concentration from 0.02 to 8 ppm (as ammonia), nitrite (NO2-) ranges from 0.005 to 0.2 ppm (as nitrite) and nitrate (NO3-) ranges from 0.06 to 30 ppm (as nitrate). These values vary by location, depth and time of year. Other inorganic forms that are present at much lower concentration include hydroxylamine (NH2OH), nitrous oxide (N2O) and hyponitrite (N2O22-). Ammonia exists in two forms in seawater. The primary form is ammonium (NH4+), which accounts for about 95% of the total in seawater at a pH of 8.1. The secondary form is free ammonia (NH3), which accounts for the remaining 5%. These proportions vary strongly with pH and the free ammonia form rises as pH rises, to about 50% of the total at a pH of 9.5. This difference is why test kits often mention both forms. These two forms interconvert very rapidly (many, many times per second), so while an individual ammonia molecule can be said to be in the ammonia or ammonium forms at any given instant in time, a tiny fraction of a second later, it might be either type. Iodine gets an amazingly disproportionate amount of discussion with respect to marine aquaria, and much of its discussion is probably incorrect. Iodine in the ocean takes a wide variety of forms, both organic and inorganic, and the iodine cycles between these various compounds are very complex and are still an area of active research. The nature of inorganic iodine in the oceans has been generally known for decades. The two predominate forms are iodate (IO3-) and iodide (I-). Together these two iodine species usually add up to about 0.06 ppm total iodine, but the reported values vary over about a factor of two. In surface seawater, iodate usually is the dominant form, with typical values in the 0.04 to 0.06 ppm iodine. Likewise, iodide is usually present at lower concentrations, typically 0.01 to 0.02 ppm iodine. Organic forms of iodine are any in which the iodine atom is covalently attached to a carbon atom, such as methyl iodide, CH3I. The concentrations of the organic forms (of which there are many different molecules) are only now becoming recognized by oceanographers. In some coastal areas, organic forms can comprise up to 40% of the total iodine, and many previous reports of organoiodine compounds being negligible may be incorrect. All of these various forms can be interconverted in the oceans. Phytoplankton, for example, take up iodate and convert it into iodide, which is mostly, but not completely, released. One research group has suggested that iodate, looking chemically like nitrate, is taken up by the same pathways, and is internally converted to iodide before being released. This process is fast enough that in one location studied, the phytoplankton can convert all of the iodate present to iodide in a month. Iodate is also converted to iodide by bacteria in low oxygen environments of the oceans. Marine algae can also take up iodide directly, and apparently do so preferentially over iodate. This process may, in fact, be a primary way that iodide is depleted from aquaria, but that's getting ahead of things. There are also abiotic (nonbiological) transformations taking place in the oceans, with iodide being potentially oxidized to iodate. These abiotic processes are probably not the factors controlling iodine speciation in the oceans, however, with biological processes predominating. In reef aquaria that employ strong oxidants such as ozone, or possibly even UV sterilizers that can promote oxidation, these abiotic factors may predominate. An additional complication in reef aquaria is that some aquarists dose a third form of iodine: I2. Lugol's solution, for example, is a combination of iodide and iodine. When iodine (as I2) is added to seawater, it quickly reacts to form other iodine species that probably end up as both iodide and iodate in marine tanks. For those who are interested, the following artificial seawater recipe is taken from "Chemical Oceanography" by Frank Millero. It makes a recipe that matches 35 ppt seawater in terms of major ions, but does not try to match all minor and trace elements, most of which will be present as impurities in the major elements. Water to 1 kg total weight. The ocean is a complicated chemical soup containing a large variety of different organic and inorganic chemicals. Many of these chemicals have important implications for reef aquarists. Beginning to understand what the various chemicals are, and how they interact with one another and with biological systems, should help aquarists have a better appreciation for what is happening in their aquaria. Hopefully this appreciation will lead, in turn, to better husbandry practices as well as more enjoyment of the reef aquarium hobby. Much of the information in this article was derived from the book below. It has a very extensive discussion of all aspects of natural seawater chemistry, and I recommend it to anyone with interest in such areas. Chemical Oceanography, Second Edition. Millero, Frank J. (1996), 496 pp. 2. Biogeochemistry of Marine Dissolved Organic Matter. Hansen, Dennis A.; Carlson, Craig A.; Editors. USA. (2002), 774 pp. Publisher: (Academic Press, San Diego, Calif.). 3. Intercomparison of voltammetric techniques to determine the chemical speciation of dissolved copper in a coastal seawater sample. Bruland, Kenneth W.; Rue, Eden L.; Donat, John R.; Skrabal, Stephen A.; Moffett, James W. Institute of Marine Sciences, University of California at Santa Cruz, Santa Cruz, CA, USA. Analytica Chimica Acta (2000), 405(1-2), 99-113. 4. Chemical speciation of copper and zinc in surface waters of the western Black Sea. Muller, Francois L. L.; Gulin, Sergei B.; Kalvoy, Ashild. Department of Chemistry, University of Bergen, Bergen, Norway. Marine Chemistry (2001), 76(4), 233-251. 5. Captive Seawater Fishes. Spotte, Stephen. 1992, 942 pp.